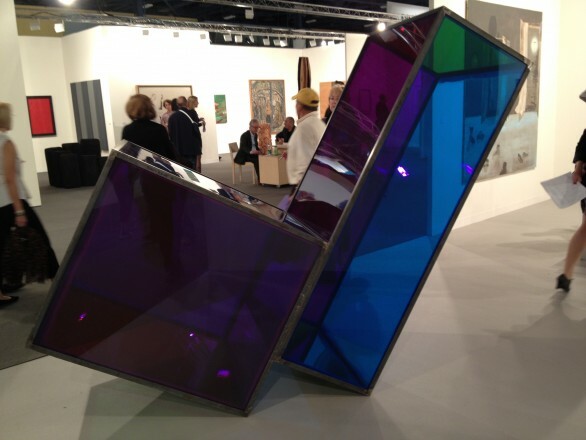 Dec 8, 2011 In: Art Fairs Tags: Art Basel Miami Beach, Enrique Martinez Celaya, Pulse Miami, Rubell Family Collection By: ArtSource Inc.
Sarah Braman’s formalist assemblages combine sections of a scavenged materials with tinted Plexiglas, to make work that is not only formalist but contains a social element. Conrad Shawcross seeks to visually represent the mathematics of sound. The artist devised a machine, adapted from the harmonograph: an instrument popularised in Victorian times consisting of two adjustable pendulums swinging at right angles to one another. Rather than using a fixed drawing surface, he pulls a scroll of paper across the swinging plate to create a long oscillation that tapers away as the motion of the pendulums decreases. 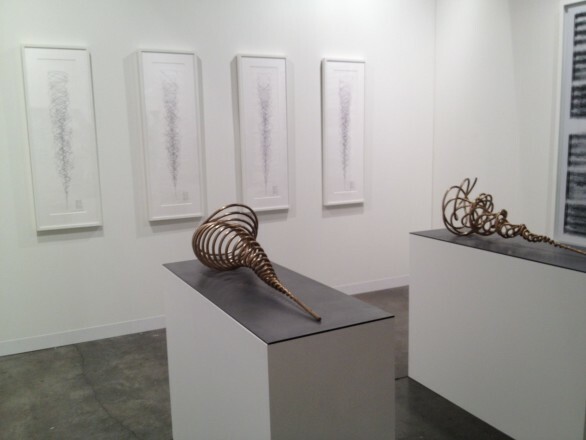 The bronze sculptures take this same principle into three dimensions, rendering sound in sculptural form. 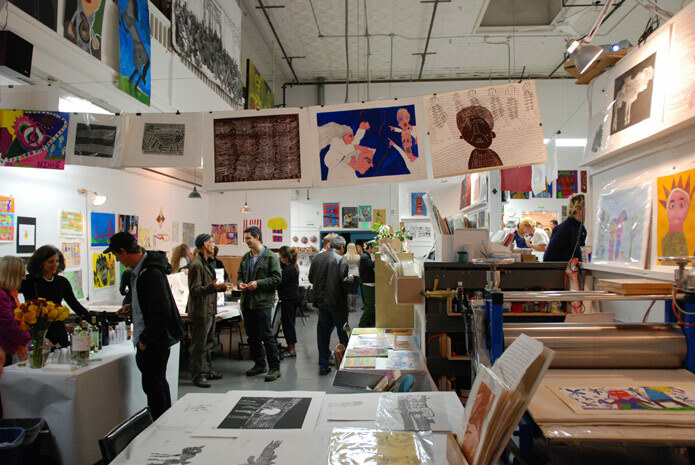 During the fairs, artists open their studios for visitors. Whale & Star, the studio of Enrique Martinez Celaya, seems more like a small museum than a typical artist studio. The cuban born artist was first a scientist, completing his Ph.D. in Quantum Electronics at the University of California, Berkeley, before his decision to leave a career in science for art. For Celaya it was important that Whale & Star was more than just his private studio and to participate in something broader than the artworld. 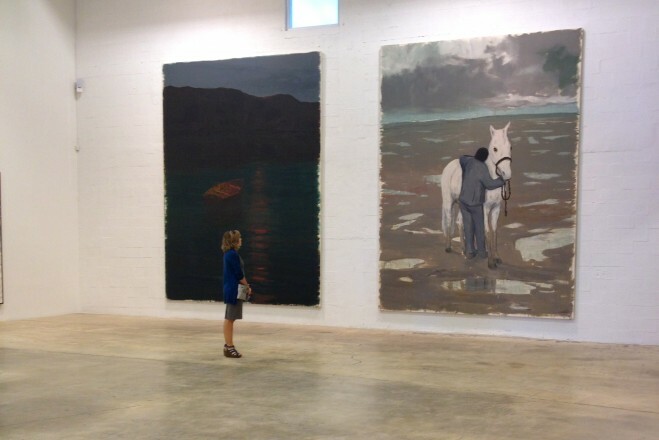 At present, Whale & Star has an internationally recognized imprint, maintains a project of public lectures by art historians and philosophers, hosts several working visits each year for poor and at-risk children, and offers a few scholarships to important educational institutions. Unique to Miami are the large private collection museums. During the fairs they have special exhibitions and performances for visitors. We visited the Rubell Family Collection and participated in Jennifer Rubell’s breakfast installation “Incubation”. Trained as a chef the artist is renowned for investigating the creative process via audience participation. The performance/installation offers visitors a morning jar of yogurt made on-site from a lab-born “culture”: inside a fabricated lab, two nurses oversee the process and slowly pass the results through a slot to spectators, who then hold up their jar to a ceiling pedestal dripping golden local honey. Jennifer Rubell's breakfast installation "Incubation"
Watch a video of visitors interacting with Jennifer Rubell’s “Incubation”. 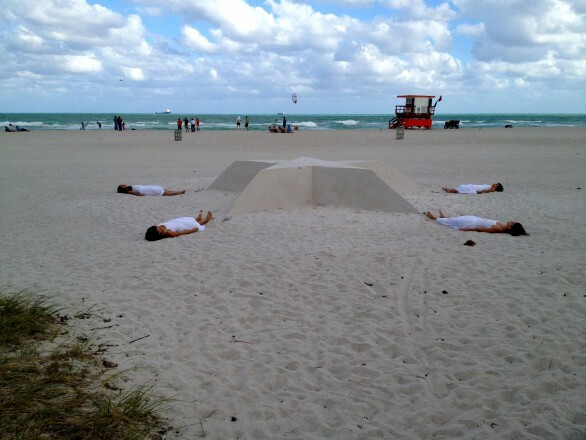 Also part of Art Basel, Art Public presents outdoor sculptures, interactive performances, site-specific installations, and public artworks within an open and public exhibition format. We enjoyed Jen DeNike’s performance “Lemanja” on the beach. The center of the performance forms a star-shaped sandcastle on the beach, around which seven women worship the Brazilian sea goddess lemanja, with dance and song. DeNike’s performance piece celebrates the ritual life that formed the basis of most ancient cultures that few people today understand. Nov 28, 2011 In: To Do List Tags: CCA, Creativity Explored, FSA, Jens Hoffmann, Jim Campbell, Leslie Shows, live auction, SF Camerawork, SFMOMA, Wattis Institute By: ArtSource Inc.
For our December To Do List, we have something for everyone. Are you looking to give the gift of art? 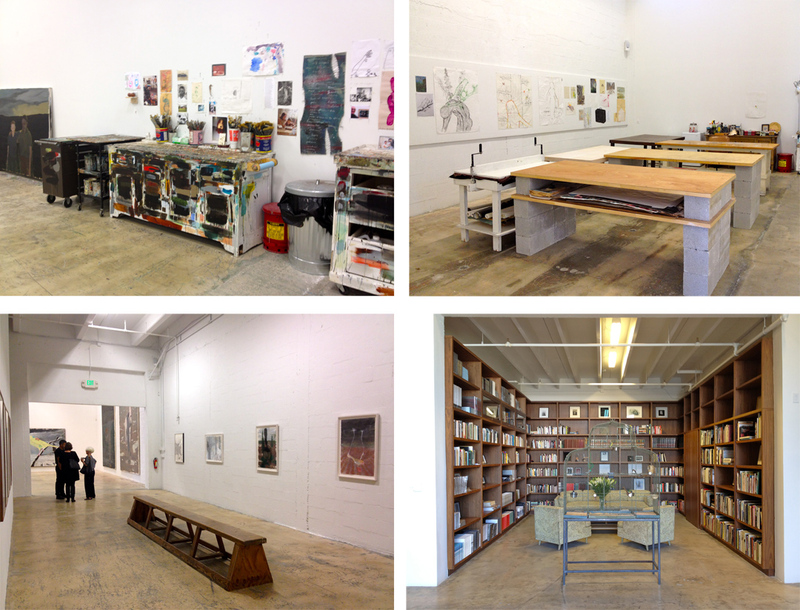 Both the Creativity Explored Holiday Art Sale and the SF Camerawork Benefit Auction are great opportunities. If you need to escape the holiday bustle, take in the artist talk at Haines Gallery or see the More American Photographs show at the CCA Wattis Institute. 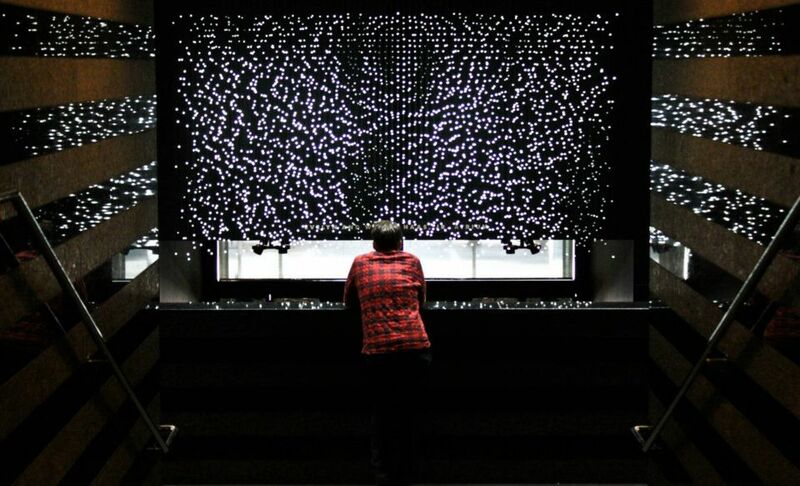 Finally, if you have out of town guests, make sure to stop at SFMOMA to dazzle them with Jim Campbell’s site specific piece Exploded Views. Enjoy! December 2-22nd – Holiday Art Sale at Creativity Explored, 3245 16th Street: Creativity Explored is a nonprofit visual arts center where over 130 artists with developmental disabilities create, exhibit and sell art. For the sale the studio will be filled with original prints, paintings, drawings, ceramics, sculptures and textiles, as well as seasonal items like note-cards and artist made wrapping paper. Opening weekend hours are Friday 12/2 6:00 – 9:00pm, Saturday-Sunday 12/3rd-4th 12noon – 5:00pm. December 3rd – SF Camerawork Auction, 657 Mission Street, 2nd floor, Live Auction at 1pm: If you’re looking for photography there are many pieces to choose from while supporting SF Camerawork. SF Camerawork is a non-profit artists organization whose purpose is to stimulate dialogue, encourage inquiry and communicate ideas about contemporary photography. SF Camerawork’s Benefit Auction of vintage and contemporary prints is on view now, culminating in a live auction at 1pm on December 3rd. Doors open at 11 am. View the auction catalog here. December 14th – 5:30 – 7:30, Haines Gallery, 49 Geary Street 5th Floor: See Leslie Shows’ current exhibit Split Array at Haines Gallery and stay for the conversation between the artist and Lawrence Rinder, Director of the Berkeley Art Museum and Pacific Film Archive. 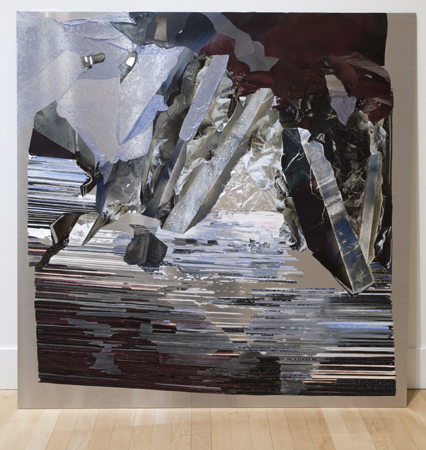 Learn how she photo realistically constructs her mixed media paintings based on pyrite rocks – more commonly known as fool’s gold. The results are beautifully luminous paintings on aluminum panels that use sheets of plexiglass, inks, mylar, crushed glass, metal dust and engraving. On view until December 17th –, More American Photographs, at CCA Wattis Institute, 1111 Eighth Street: This exhibit features historical photographs from the Depression-era Farm Security Administration’s photography program, which commissioned photographers to document the rural poor of America. Curators Jens Hoffmann and Jana Blankenship commissioned 12 contemporary artists to travel the U.S. for a year and document the impact of today’s “great recession”. Installed together along with FSA photography program objects and documents, this project aims to update the FSA file, showing how some parts of America have floundered while others have flourished. Special talk with photographer William E. Jones on Wednesday 12/7 at 7:00pm. 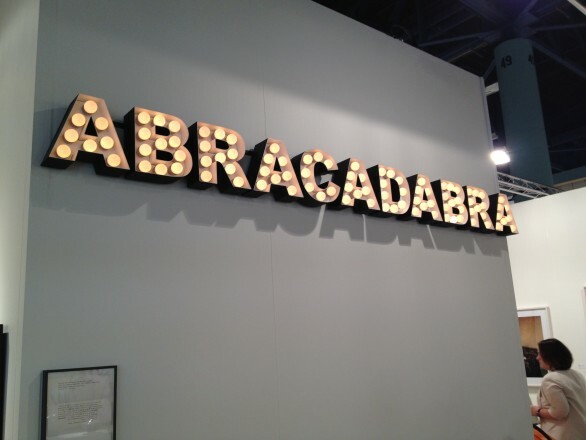 Watch the video of Jim Campbell describing the process of creating this piece by clicking here.